Ever since our fires 2 years ago, I have found ants in my house that are not my normal ants. They do not look like my ants, nor do they behave like my ants. Most ants will send out scouts until they find a food source, then they lay a pheromone trail leading to the food. The other ants of the colony will pick up the scent of the trail and proceed to make a tail to and from the food until it is depleted. if you place an anttrap near the trail, some will explore and find the new source. They then will take the poisoned food back to the colony where the other ants eat it and die. Personally I pray a mixture of peppermint oil and dish soap mixed with water right on the trail. The ants will find their way around the dead ants yet if you leave it long enough they will not only disappear, they will also police their dead (meaning they will take their dead home to the colony for burial. These trailing ants let off an acrid smell when crushed and taste acidic, thus my mother's nickname "piss ants". (I drink tea so have had the misfortune of consuming an ant or two. These new ants seem to be all scouts. they wander around aimlessly looking for something, anything. Once they find food, they eat it and usually die or wander away. They are attracted to grease, sugar, lemons, bread products and protein (I saw some chomping on a drop of blood on the floor. They don't lay trails and no other ants return to partake in the bounty. They bite, gently. When squished they smell like sour apples. They also taste like sour apples (see above for consumption incident). If you leave a glass which had tea in it, they will swarm all over the cup, only to die in whatever water is left or for some other reason. It is amazing how quickly they find it, I have tried hiding it. Within an hour or two it is covered in mostly dead ants. When I fill the cup with water, the ants clump together, unlike regular ants. When they die, they die out so that if you brush them aside they crumble.They never work together to try and carry anything big. They always act like loners. I tried ant bait. They came to the bait, ate it and died. now I have a puddle of ant bait and dead ants. One thing that is normal, they are repelled by cinnamon like other ants. I called my ag department who referred me to the UC extension to see if they could identify these ants.They are making me crazy and I have no idea where they are getting in from. I no longer have regular ants except outside and occasionally near my garbage can. Any assistance is greatly appreciated. Well what a dilemma, I feel for you.... there is nothing like having unwanted pest in your home! You are so astute watching and observing all the changes and knowing that the ants are different from previous years, I totally believe you, once you have been plagued with a pest you notice everything. I did some research, the extreme fires that California has been devasted by in the past several years would most definitely cause an impact on all aspects of flora, fauna and all the birds, bees and insects. The description of the smell that exudes form the ant's body when it is crushed is a true clue. Considering that all the prime source (plant-based honey dew) food that these “odor ants” go after has been destroyed in the wildfires, the ants are probably just baffled and are wandering to find any food source. Read the description below from the ant identification site and see if we are at the same conclusion.? This small non-stinging ant is about 1/8th inch and colored dark brown to black. They get their name from the rotten coconut-like odor that they produce when they are crushed. They routinely invade houses searching for food during the winter, when their usual honeydew food outside is gone. Like the Argentine ant, colonies contain multiple queens and a few thousand worker ants. They nest under stones and pavement and will establish nest inside houses also. Life Cycle – Females lay only one egg per day, which mature into larvae in 2-3 weeks. They remain as larvae from 2-4 weeks, and then enter a pre-pupal stage for 2-3 days. The pupal stage lasts an average of two weeks before they become adults. Several generations can develop each year, and the females may live for several years. Males only last a few days after emergence. I would reach out to the state labs and field extension center to find the best way to combat these tiny creatures. 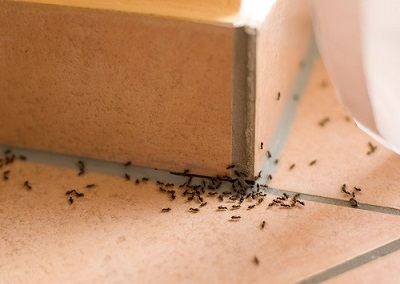 The Odor ants are not common on the east coast, I do not want to suggest unwanted chemical use if there is a defined solution to ridding your home of the ants. My west coast team members may have a remedy as well. Thank you for your question and thank you Maureen for a great article as well. The ant population has indeed exploded in the fire areas. The most likely answer for this invasion into the homes is due to the destruction of much of the surrounding vegetation. It does seem almost fruitless to continue to place baits out the what seems to be an endless hoard of more than 27 different species of ants, but persistence and Mother Nature will pay off. The recent rains will promote more growth and eventually the hill sides will green up and what is left of the brush may return. Meanwhile, the ants are looking for food and moisture. The Alameda County Vector Control Services District has been besieged by calls regarding this invasion of ants. "We don't take a whole lot of ant calls. But when our officers are in the field, they hear about ants all the time," Wilson said. "This year has been worse than the last few, judging from our own observations and the public response." Environmentally remedies seem to be people’s top choice for dealing with this invasion, but so far it has not proved to be effective. The solution is persistence and the realization that you probably will not “Win” this battle, but only be able to mitigate it to a tolerable level. Chip Johnson is a San Francisco Chronicle columnist who stated that "The idea of trying to kill the colony is fruitless," he said. "There are about a billion ants out there so it's best to go for a deterrent." A good deterrent is to use a “Metabolic and/or an Anabolic inhibitor. The Amdro Ant Block is an Anabolic inhibitor. Worker ants carry it back to the mound thinking it is food. Once the queen eats it, the colony is doomed as she can no longer produce worker ants. The Amdro Fire Ant Bait is another effective choice, but it targets the Red Imported Fire Ant. This bait contains the ingredient “Hydramethylnon” as well as Defatted Corn Grits, Sucrose and Hydroquinone, tert-butyl which will kill the queen by preventing the ability to metabolize any food, thus the colony starves to death. Prevention is another good source. Ants are after either food or moisture or both. Try to eliminate any food source. Keep the counters and the floors swept and clean. Wash your hands after handling any sweet or oily substance. Wipe down what ever you have touched. Remember, even your fingers will have oils on them, even if you have not handled any food! Make sure you have no dripping faucets outside or inside, especially in this upcoming hotter weather. ANY food or moisture will attract these voracious ants so you must be continually on your guard.